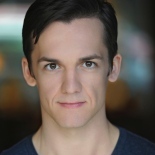 Merlin Huff received his MFA in Acting from the Yale School of Drama in 2014. He graduated from UC Santa Barbara in 2011 with a double major, receiving a BFA in Acting and a BA in Philosophy. Credits include Yale School of Drama: Vieux Carré (Tye McCool), Blueberry Toast, Twelfth Night (Orsino), A Midsummer Night's Dream (Bottom); Yale Cabaret: This., Carnival/Invisible; Feature film: Lackadaisical Baby; Short films: A Visitor in Time (Hemingway), Take Care. Web series: The Fireturtles: An Indie Rockumentary, Off Prospect, Swerve. He currently lives in sunny Los Angeles with his wife and doggie.